Personal Trainer / Fitness Trainer / Gym coach. Looking for one? There are countless of benefits you can gain from having a good personal trainer. Having the right trainer will definitely makes you reach your goals faster. Exercise prescription for individual body types can be challenging because our body responds to training differently. There are 3 body types, ectomorph, endomorph and mesomorph. Can you change your body shape through our specialised program? The answer is yes. The interesting fact is we can’t change your body “type” but we can shape it up if we do it correctly. That’s why it is very important to formulate an individualised workout schedule specifically for your body type. Knowing what works or not, through constant trial and error. Firstly, we don’t just duplicate our workout contents for our clients. Every client’s goals and targets are different. Careful arrangement of exercise variations and program length is important. Taking off a training plan from a website or a magazine is a big no. These free fitness plans you see online are either too general or too complicated. We can only use them as references to build our own program. Also, we have to take a person’s medical condition into concern when designing one. You wouldn’t want to do heavy overhead press when you have shoulder impingement right? What fitness component you are targeting. Aerobic or anaerobic fitness? Or both? Focus on muscle hypertrophy, weight loss or general fitness? Training schedule. How often? how many times a week? Duration of each session ? Strength and conditioning. Includes bodyweight training, resistance work, powerlifting, endurance training, core work, circuit training or HIIT and exercise rehabilitation. Volume of the exercises. How many sets and repetitions. Variety of the exercises. Are we going to do the same routine every time or should we do different stuffs? It depends. Our tricks are simple. There are no miracles or gimmicks to achieve a successful body transformation. Its all hard work and careful planning. Time is what we need. Fitness is not an overnight process. Its a lifestyle. You can have the most fanciful training plans but does it takes you to your targets? Here, we follow the basics and build solid foundation. Nailing basic exercises and building up general fitness is the first thing we do. Our training is steady and progressive, minimising injuries. Till now, we still stick to the basic formula for losing weight, calories deficit. Just follow the below equation closely. Strength and conditioning is a total combination of every fitness components such as resistance training, flexibility training, interval training, cardiovascular endurance training and functionality training. The interaction of the above components together with a well balanced diet forms a ‘bullet proof’ muscle conditioning program. We design an effective exercise prescription based on below points. Weights lifted, muscles shorten, performing a concentric muscle action. Weights lowered in a controlled manner, muscle lengthen, known as eccentric muscle action. Activation of muscle with no visible actions, known as isometric muscle contraction. Repetitions is the number of times u lift. Set is a group of repetitions performed continuously without stopping. Repetition Max (RM) is the maximum no of reps you can execute till failure with a proper technique. Strength is the amount of force you can generate in a rep.
Plyometrics training to develop power. Power is the rate of force production from your muscles. We ensure all exercises are performed in a safe manner. Make sure no jerking, with a slow and controlled manner. Go for full range of motion but avoid hyper extension of joints. Lift the weights you can manage. Spotting is a necessary, engage a personal trainer (spotters must be attentive at all times). Proper breathing (exhale during exertion, inhale during relaxation). Make sure sports equipment are well maintained. Various types of strength and conditioning techniques and systems we use. Machine weights, free weights or body weight exercises. Speed and velocity (Power development. Heavy resistance slow speed or light resistance fast speed). Concentric, eccentric or isometric training. Concurrent strength and cardiovascular training. Single-set system (Doing only 1 set for each exercise). Multiple-set system (Doing many sets for each exercise, with various resistance). Super-set system (Doing 2 or more different exercises in a row with no rest in between). Drop-set system(With the same exercise, do a few sets with a decreased resistance straight after each set). Compound sets (alternating of exercises between different muscle groups). Long-term health benefits from our personal training program. Improves balance and motor control. Improves sports performance (fires up neurological functions). You have to roughly know how fit you are. The first thing we do after a medical analysis, is to get our clients to do simple fitness tests. From there, we gather a baseline score so that to set up bench marks to measure future progress. These simple tests will measure your aerobic and anaerobic fitness, muscular strength, agility, coordination, flexibility and body composition. Do 1.6km or 2.4km run timing to gauge aerobic fitness. Number of sit-ups in a min for abdominal strength. 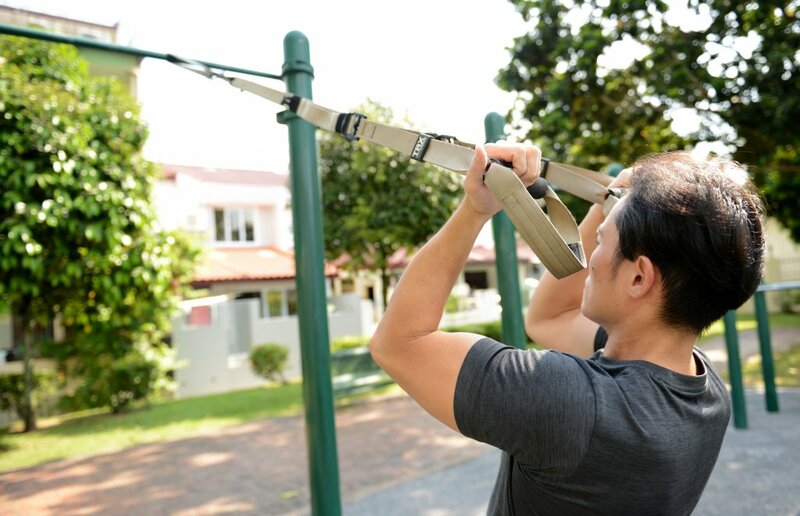 Number of pull ups and push ups in 1 go to test upper body strength. Perform PNF stretch protocols to test for flexibility. Basic agility drills and hand eye coordination. Body composition measurement using to determine body fat %. Create a routine and set the volume of the workout. Create a well balanced diet plan. Invest in a good pair of trainers, running shoes or cross training shoes. Start slow and progress gradually with proper warm up and cool down regime. Remember to hydrate yourself and listen to your body. Stop if unwell. Stay focus and be creative. Retake the fitness test and assessment every 2-3 months. Watch out for plateaus. Change the program content once a while to continuously shock the body. Keep motivating yourself and establish a healthy lifestyle. The above 4 steps is a basic kickstart for everyone, but keep in mind, the most important thing is to be patient. It often take weeks, months and even years to achieve certain goals. Lots of experimenting with different types of workouts and diet plans that fits your current busy lifestyle. In fact, there is no perfect exercise regime for everyone. Its about the enjoyment of the training process that changes one’s life. 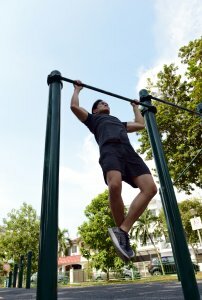 However, finding a reliable and affordable personal trainer in a lively city like Singapore can be a challenge. If you’re looking for a sought after celebrity trainer, you will most likely be recommended to those that charges more than $150 per hour. So is it worth spending your time and money on your own health? The answer is definitely a yes! At PT works, we offer you the most affordable and effective personalised training program. There are different types of programs with different exercises that you get to choose yourself to spice up your fitness journey. Our services include fat loss and muscle building, muay thai boxing, sports massage and many more! PT works offers you three different packages that you may choose from according to your own preferences and fitness goals. Our training rates are $900 for 10 sessions package, $1700 for 20 sessions package and $2880 for 36 sessions package. On average, you won’t be spending more than $90 per session. Contact us for promotional personal training prices. We do give discounts for starters! Besides being affordable in prices, we also offer other benefits such as time flexibility, training at your preferred location, personalised diet plans and providing a thorough full body composition analysis. What else can you gain from the best trainers in PT works? We can create a personalised workout plan that matches your medical background as well as current physical condition. Each of our programs are formulated to help you to achieve your goals, be it gym workouts, strength and conditioning, cardiovascular fitness, flexibility and coordination, psychological mental wellness and exercise rehabilitation. Finding the best person to train you in Singapore is not difficult. But finding the certified one who has many years of experience and certification is not easy. Its true. Everyone is genetically different. We can’t have the same exercise program for all our clients. Here at PT works, you will be trained personally with our knowledgeable certified trainers, with our scientifically proven programs that guarantees to match your needs. You should find someone that can help you to improve your health and create short term goals that are realistic and achievable. And hiring the good ones doesn’t always have to be expensive. Its all about the value. Click here for a trial class!